Deborah Emmanuel seems like a sunny enough character. The Singaporean writer is young, witty, affable and attractive. Even her rave-reviewed collection of poems is called When I Giggle In My Sleep. So when she says she has taken a short break from writing and performing her poetry to pen a non-fiction novel based on her own experiences, you wonder what she could have possibly lived through that would take a whole book to tell. As the DRS is meant to rehabilitate young people rather than punish, the stint did not go on her permanent records. 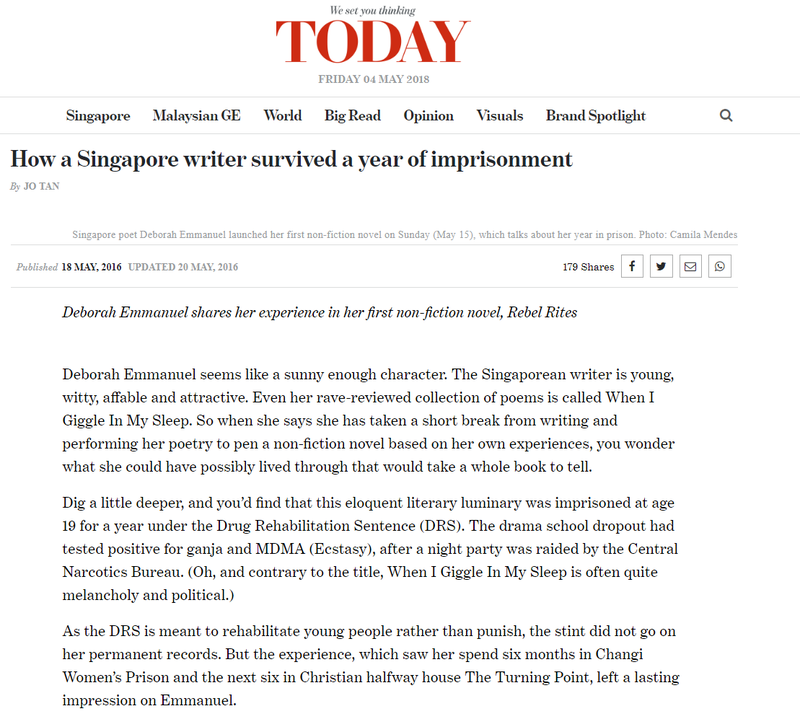 But the experience, which saw her spend six months in Changi Women’s Prison and the next six in Christian halfway house The Turning Point, left a lasting impression on Emmanuel. “After I was freed seven years ago, I just wanted to leave the experience behind by working very hard. In order to feel comfortable as to why I had been there, I had to believe I was punished for a reason — I was wrong, and I needed to become a better person. That drove me to achieve things and pursue a more productive life,” said the 27-year-old. So rather than continuing her efforts in leaving the traumatic time behind, Emmanuel decided to capture it in writing. It wasn’t easy though. “I tried for a long time, but I couldn’t fit a year of being imprisoned, and the really intense accompanying stimuli, into one poem,” she explained. After a year of writing and rewriting, Emmanuel’s first non-fiction novel, Rebel Rites, was completed. But she was confronted with another hurdle: She needed to fund its printing and publication. So she set up a crowdfunding campaign, and exceeded her target even before the deadline, with donations coming in from all over the world. Emmanuel is aware the content of her book is “sensitive”, to say the least. “You see, with the story and the way I tell the story, there are definitely some issues about the system that come up. I question the way that we rehabilitate most drug consumption offenders. We punish people who smoke marijuana or pop Ecstasy the same way as hard-drug abusers who, say, shoot up heroin — in the same way or similar ways, at least at the time I was in there,” she pointed out. After seeing what many of the inmates experienced, she grew cynical about whether prison really gives those imprisoned a second chance. “How are you supposed to leave believing you will amount to anything?” she said, adding that she managed to carve a life for herself only because of family support. So what is Rebel Rites to Emmanuel, if not a prison success story? “It’s a story about equality,” she said.